There's something about seeing a destination from above that makes it magical. Flying over a locale, descending through wispy clouds and getting the first glimpse of a city's skyline, a mountain resort's countours, or a beach venue's cluster of islands, provides us with a better understanding of the geography of the destination in which we are about to land. This epic series offers rare glimpses of our nation's most treasured landmarks, all seen from breathtaking heights. From busy cityscapes to quiet landscapes, we capture the history and the pageantry of our amazing country, which is as diverse as the people who occupy it. The Smithsonian Channel was kind enough to lend us some of the amazing photographs its producers have taken over the course of filming this groundbreaking series. 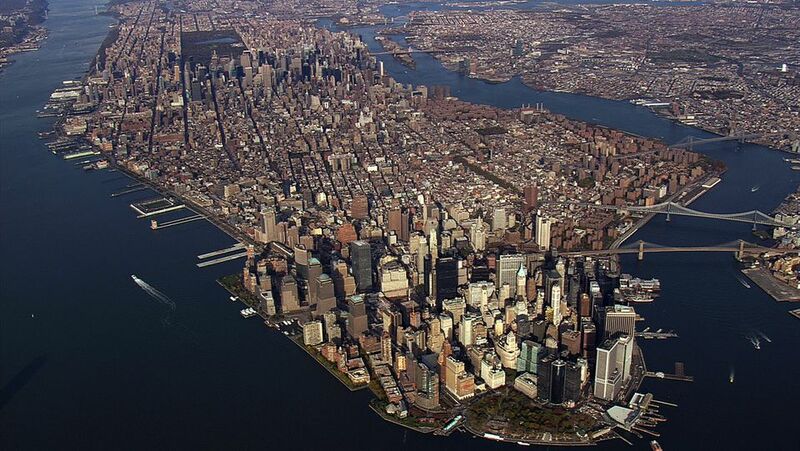 The photo on this page shows, of course, a helicopter's eye view of the island of Manhattan. I love that you can see the detail of the density of New York City, its grid of streets, the many piers that fringe it, and the green patch of Central Park in the north. On the following pages, you will find 10 more outstanding photographs of landscapes, many of which are of destinations not typically documented in such detail from the air. The Smithsonian Channel intends to produce Aerial America episodes for all 50 states. You can see which states have been filmed, are in production, or are currently being filmed on the Aerial America website. You can also submit your suggestions for places that Smithsonian Channel aerial photographers should photograph while in your state. Nevada's Pyramid Lake lies about 40 miles northeast of the city of Reno. Watch Aerial America on the Smithsonian Channel. This photograph of Mississippi's Gulf Islands captures them at sunset looking both fragile and serene. The highest mountain in the lower 48 United States, Mount Rainier is in Washington State and is a sight to behold from any height. This photo above the snowy range is particularly breathtaking. Schuylkill lies in eastern Pennsylvania at the source of the Schuylkill River. Here, we see hundreds of symmetrical rows of grains ready for the fall harvest, an idyllic image often seen from above "fly-over" states but rarely photographed in detail. A field of brilliant green takes on a geometric pattern when the Smithsonian Channel filmed these pineapple fields in Hawaii. About's Guide to Hawaii Travel has information on Maui Gold Pineapple and tours. In addition to providing us with a beautiful aerial shot of Hawaiian pineapple fields, the Smithsonian Channel provided this shot of the Na Pali Coast on the Hawaiian island of Kauai. The cliffs of the Na Pali Coast make it very inaccessible, which is why this aerial shot is so special. About's Guide to Hawaii Travel tells us how you can tour the Na Pali Coast by charter boat. Created as an artificial lake in the 1950s by the Army Corps of Engineers, Lake Strom Thurmond, at the border of South Carolina and Georgia, looks as if it has returned to nature in this photograph from above. About's Guide to U.S. Parks lists the lake and its environs as one of the most scenic byways in South Carolina. It is also a favorite recreation spot for residents and visitors of the state. A favorite destination for geology buffs are the Painted Hills of Oregon. Formally part of the John Day Fossil Beds National Monument, the "paint" of these hills have been formed by volcanic deposits over millions of years. In the far northwest corner of New Mexico rises Shiprock, an unusual rock formation known as an inselberg. Shiprock is sacred to the Navajo Nation, who call these parts home. About's Guide to Geology has another gorgeous photograph of Shiprock dusted with snow. Rocky Mountain National Park in Colorado is one of America's most visited parks. It contains, of course, the peaks of the great Rocky Mountains but is interspersed with mountain streams and evergreens as shown in this aerial photo. Where Are the Largest Shopping Malls in America?